The growing season is ahead of us, and already there’s talk about late planting – which is likely as the two-week Central US forecast is rather wet. Our work suggests that planting dates, alone, don’t seem to affect yield potential, but it’s almost that time of the year in which the perception of US crop production changes on a daily basis, and markets change along with them. However, AgResource does advise a certain amount of caution in the next 3-4 months. This is partially due to rising South American production, no doubt, but also due to very large carryover stocks. 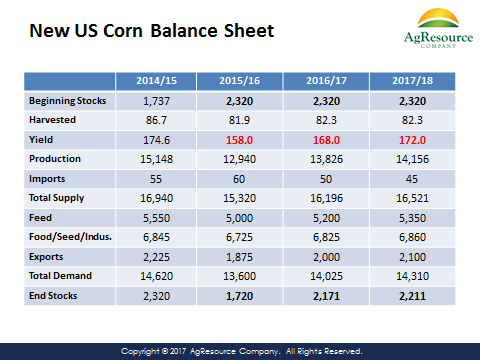 The table above includes US corn supply & demand in 2017/18 using various yield scenarios (well below trend, trend and slightly above trend), and notice that in no case do US corn stocks fall dramatically. Note that with any reduction in crop size, feed/residual use will also be lowered, as will exports. Even end stocks of 1,720 Mil Bu correlate with rally highs of $4.40-4.50, basis Dec corn, during the summer months. Or, in another example, yield variations in world production will also have a limited impact this year on trade flows. 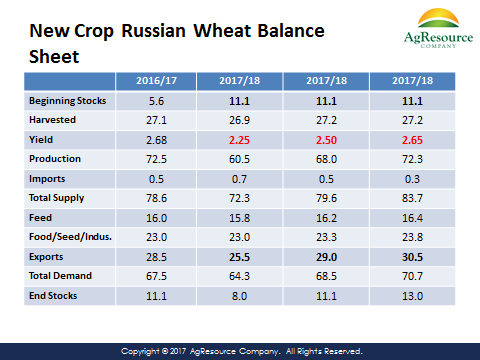 New crop Russian wheat supply & demand is above, with similar yield scenarios included. A rather dramatic drought has to be established across Central and Siberian Russia to materially impact Russia’s export potential, which is certainly possible but is not indicated at this time. The bottom line is that weather-driven rallies in the next few months should be viewed as selling opportunities rather than any significant shift in market fundamentals.